Here is a link to the Channel 9 Page with the Video! Local volleyball legend Fran Zelinkoff turned 90 on Aug. 1. But her age didn't stop her from getting back on the court. Friends, family and teammates packed a room in the Eagle Point Rec Center July 30. The buzz of conversation quickly turned to a quiet hum as the news arrived. "Fran's coming!" someone half-shouted, half-whispered. When the door opened, the entire room erupted into cheers of, "Surprise!" Zelinkoff said stepped inside slowly, decked out in her volleyball attire. Her friends had convinced her to play another game or two in the gym while the party guests filed in to their hideout. "What a group," Zelinkoff said. "My goodness some of these people were with me from day one." Day one of Colorado's Volleyball transformation was some time ago. The surprise party on July 30 was for Zelinkoff's 90th birthday. She started playing in the early 1960's after giving up tennis. From there, she's had a hand in starting the Colorado Volleyball Association, The Rocky Mountain Region of the United States of America Volleyball Association and the Colorado Senior Volleyball Association. 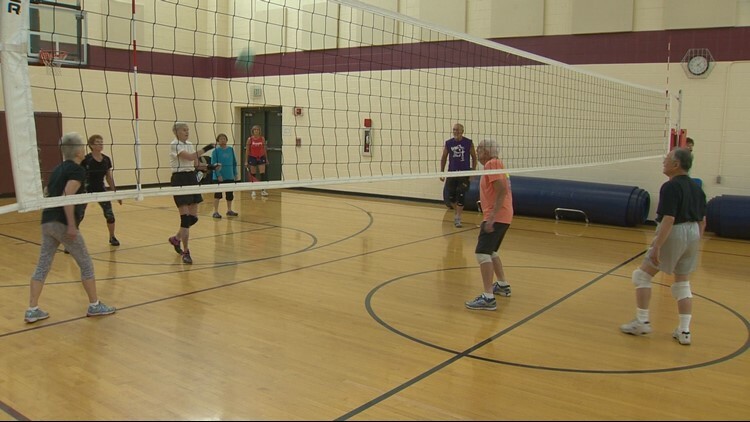 She also played a major roll in getting volleyball added to the Huntsman Senior Games in Utah. "She started every program there is here," her friend Carla Shover said. Zelinkoff said she wouldn't be the same without volleyball. "My life has pretty much been volleyball since I gave up tennis," she said. Making that switch was easy, she added. Team sports are more her thing. "It's a wonderful feeling to know you have six people on the court that are good friends and really compatible,” she said. At 90, she doesn't play as much as she used to. "I have tissue paper for skin and every little ball knicks and bleeds," she said. But any day she can get on the court is something worth celebrating. "I tend to want to stay with volleyball till the very last day that I can," she said.